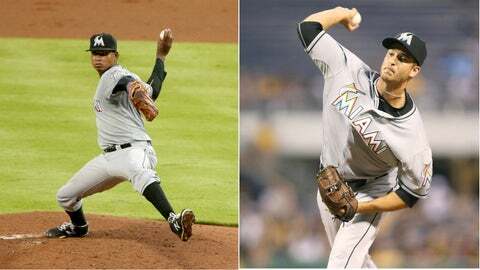 The injury bug continued its season-long attack on the Miami Marlins as the ballclub placed right-handers Jose Urena and Andre Rienzo on the disabled list Firday, while calling up righties Kendry Flores and Kyle Barraclough. Urena exited Thursday’s start against the Atlanta Braves after just two innings when he got struck by Daniel Castro’s liner with one out in the second. He allowed five runs on six hits on 40 pitches in his second start back in the big leagues. The 23-year-old rookie lands on the DL with a left knee contusion. Rienzo has a left knee laceration he likely sustained during his last outing four days ago. He gave up three runs on two hits with two strikeouts and two walks in 1 2/3 innings against the New York Mets. Yoenis Cespedes collided with the right-handed reliever at the plate when Rienzo covered home on a wild pitch. Flores, part of the offseason deal with the San Francisco Giants for Casey McGehee, tossed 3 2/3 scoreless innings over two appearances in his first big-league stint with the Marlins in early June. The 23-year-old righty has posted a combined 6-5 record with a 2.34 ERA in 19 starts between Double-A Jacksonville and Triple-A New Orleans. Miami acquired Barraclough from the St. Louis Cardinals for former closer Steve Cishek on July 24. The 25-year-old righty was 5-6 with a 2.83 ERA and 25 saves in 100 games in the Cardinals farm system, making the Texas League All-Star team in 2015. After joining the Suns, he tossed four scoreless frames, allowing just one hit with nine strikeouts and one walk over four outings. Barraclough recorded two saves. He has yet to make his major-league debut.